The definitive screwball comedy, My Man Godfrey follows the madcap antics of a wealthy and eccentric family when they hire a down and out "forgotten man" as their butler. My Man Godfrey features brilliant performances by Carole Lombard and William Powell and was the first film to receive Academy Award® nominations in all four acting categories. Academy Awards: Nominated for Best Director; Best Actor-William Powell; Best Actress-Carole Lombard; Best Supporting Actor-Mischa Auer; Best Supporting Actress-Alice Brady, Best Screenplay. 1937. DVD: Standard 1.33:1; Audio English Monaural; subtitles English; closed-captioned; single sided - dual layered; 21 chapters; Not Rated; 93 min. ; $39.95; street date 7/31/01. Supplements: Audio Commentary by Film Historian Bob Gilpin; “Lux Radio Theater” Adaptation; Rare Outtakes; Production Stills Archive; Newsreel Footage; Theatrical Trailer; Production Notes. Audiences love to see the little guy prevail and the high and mighty take one on the chin, and I’m sure those preferences were even greater during the Thirties. In the grips of the Depression, there were a lot more little guys than usual, and though many rich folks also suffered, the disparity between the haves and the have-nots seemed to be greater than ever. Within that context, a film such as My Man Godfrey makes a good deal of sense. It shows the poor - as represented by homeless “forgotten men” - to be virtuous, thoughtful and caring, whereas the rich seem to be frivolous, self-absorbed and inane. It seems logical that Depression-era crowds would eat up this sort of material. However, I don’t want to pigeonhole Godfrey as a period piece with no appeal outside of its era. While the time in which it was made clearly impacted upon the production, the movie remains a charming and entertaining program that offers solid material that neatly transcends chronological barriers. At the start of Godfrey, some wealthy Manhattan socialites descend on a local dump to fulfill the requirements of a “Scavenger Hunt”. This game requires them to find a number of items that people don’t want, and one of the objects is to grab a “forgotten man”, the film’s term for homeless guy. We meet the Bullock sisters as older, more dominant Cornelia (Gail Patrick) offers the first man she encounters, Godfrey (William Powell) five dollars to come with her. Down on his luck but not without pride, Godfrey refuses, and he indirectly intimidates Cornelia to fall into a pile of ashes. Cornelia’s sister, somewhat ditzy Irene (Carole Lombard), comes to realize ever-so-slightly that this was a dehumanizing experience, and she relates this to Godfrey. Once she explains the game to him, he agrees to come with her just to show up Cornelia; if Irene brings in the first forgotten man, she’ll win the contest. That she does, and as thanks to Godfrey, she offers him a job as the Bullock butler. He accepts, although he quickly learns that this may be a rather challenging task. That’s because the Bullocks are a rather dysfunctional family, albeit in a zany way. Mother Angelica (Alice Brady) is a motor-mouthed and flighty broad whose main interest is in her “protégé” Carlo (Misha Auer). He’s allegedly a musical prodigy, but his only apparent talent revolves around his prodigious eating abilities. Cornelia is a haughty brat, and Irene is a dippy girl who’s less domineering than Cornelia but she seems spoiled in many others ways. The only fairly normal member of the household is father Alexander (Eugene Pallette), the gruff presence who has had to put up with his family's shenanigans for many moons. Although maid Molly (Jean Dixon) doesn’t expect him to last long in the position, Godfrey quickly becomes a positive influence in the Bullock household, though some parties are more receptive to his presence than others. Cornelia maintains an antagonistic attitude toward him, partially fuelled by Irene’s obvious affection for him. At its heart, Godfrey is a romantic comedy, though we’re not always sure which Bullock daughter will win his heart; though Irene shows the most overt interest in Godfrey, a subtext in which Cornelia also desires him seems apparent. Anyway, the movie mainly follows Irene’s attempts to ensnare Godfrey’s affections, though it has a few mystery elements along the way. That’s because we don’t learn much about Godfrey’s past until midway through the film when an old friend named Tommy Gray (Alan Mowbray) appears on the scene. That’s when we find out the circumstances that brought Godfrey to the level of “forgotten man”. Earlier I indicated that I felt Godfrey glorified the noble poor while it mocked the idle rich. Although those sentiments are true, I shouldn’t lead you to believe that the film totally disparages the wealthy. Many of the “forgotten men” came from the ranks of the formerly-prosperous, but some ended up at the dump due to dignified intentions. For example, one of the guys owned a bank, and when it failed, he paid the depositors out of his own pocket rather than see them suffer. As such, Godfrey relates that the rich are human, but they need some harsh circumstances to make them appreciate what they have (or had, as the case may be). I won’t go into the details of how Godfrey ended up on the dump, as I’d rather let them be a surprise to new viewers, but suffice it to say that his origins fit into this model. Even if one doesn’t dwell upon the film’s social commentary, it offers a very entertaining and witty experience. As is the case with most comedies, Godfrey works largely due to the talents of its cast. Obviously this kind of movie also needs crisp writing and swift direction, but I feel that comedies depend on their actors more so than any other kind of film; if one performer is great, they can be wholly entertaining despite a myriad of other flaws. Godfrey didn’t suffer from those concerns, but the talented actors helped take it to another level. As the lead, Powell displayed appropriate charm and elegance and he functioned as the appropriately calm center amidst all of the goofiness that surrounded him. Powell functioned as a solid straight man, and he helped make Godfrey believable and likable despite some characteristics that could have seemed self-righteous. Powell and Lombard showed a fine chemistry, probably because they’d known each other for many years; the two had even been married at one point. As Irene, Lombard seemed to be appropriately zany and off-kilter, but she still let us see the character as a caring and warm person despite some stereotypical “dumb blonde” traits. The film’s supporting cast seemed to be equally good, if not better. I really liked Brady’s turn as the babbling mother. She didn’t need to show the human restraint found in Irene, so she was able to make the role a wild loon who was consistently entertaining. Auer was also delightful as the “tortured artiste” who really was nothing more than a loafer and a leach. His impersonation of a gorilla offered one of the movie’s comic highlights. My Man Godfrey suffered from an awkward and forced ending, but otherwise I thought it was a fun and frisky little comedy. The film’s roots in the Depression era seemed clear, but it didn’t feel like a relic of the past. Instead, the movie offered an enjoyably light and witty experience that has held up well over the years. My Man Godfrey appears in an aspect ratio of 1.33:1 on this single-sided, double-layered DVD; due to those dimensions, the image has not been enhanced for 16X9 televisions. Inevitably, the picture betrayed some concerns, but as a whole, I found this to be a surprisingly positive visual experience. Sharpness generally appeared to be nicely detailed and accurate. A little softness crept in on occasion, but these instances were fairly rare. The majority of the film looked distinct and well-defined. I detected no problems related to moiré effects or jagged edges. Black levels usually seemed to be rather rich and deep. I noticed some moderately weak contrast during a few scenes, particularly those that took place in the Bullock family’s parlor. For example, the cocktail party scene looked too bright. However, most of the movie showed solid dark tones, and shadow detail consistently was clear and appropriately opaque. As one might expect from a 65-year-old film, print flaws offered the biggest concerns during Godfrey. The film often seemed to be somewhat grainy, and I also noticed fairly frequent examples of speckles. In addition, occasional examples of blotches, nicks, vertical lines and other defects appeared. However, I must say that for such an old movie, I found the image to look quite clean. No, it wasn’t flawless by any stretch of the imagination, but the picture of My Man Godfrey offered a very fine presentation. The monaural soundtrack of My Man Godfrey also seemed to be positive for an older film. Dialogue showed some concerns, which became a problem due to the chatty nature of the flick. The lines usually remained easily intelligible, but I discerned some edginess to speech throughout a lot of the picture. The biggest problems related to Brady's material; her work occasionally could be difficult to understand. The remainder of the track was less important, but it worked acceptably well. Godfrey featured no true score; after the credits, it offered virtually no music that didn’t appear as part of a scene, such as Carlo’s piano playing. The music sounded somewhat shrill and harsh, but it remained fine for an old recording. The same generally went for the movie’s effects. Again, these were usually minor elements of the track, so they didn’t make much of a difference. During one of the few louder scenes, I noticed some distortion and tinniness when a dump truck roared past us, but for the most part, effects remained fairly clear. Many older films are burdened with excessively noisy soundtracks, and some of these flaws appeared during Godfrey. I heard a little hiss at times, but that was about it. For its age, Godfrey offered a surprisingly clean and defect-free background, and that’s why it earned a “C+” despite some speech-related problems. Ultimately, it was a pretty decent piece of audio for its era. This Criterion release packs in some solid extras, starting with an audio commentary from film historian Bob Gilpin. Although this piece also includes some facts about the movie’s performers and crew plus some production notes and remarks about the era, for the most part Gilpin offers a deconstruction of the flick itself. He gets into the nuts and bolts of the filmmakers’ techniques and provides a nice analysis of the movie. If you want to know more factual information, you’ll be disappointed, but I thought this was a very interesting discussion of the format and the way the movie worked. Another audio program offers a 1938 radio show, a Lux Radio Theater adaptation of MMG. This 60-minute and 35-second performance featured a number of the film’s stars; William Powell, Carole Lombard, Mischa Auer and Gail Patrick reprised their movie roles. Of the replacements, David Niven was notable as the radio version’s Tommy Gray. He does fine in the part, but the new Alexander Bullock was a dud; Eugene Pallette offered a wonderfully gruff and vivid performance in the film, but the radio show’s Wallace Clark was too mannered and ritzy. The “Lux” show offered an abbreviated version of MMG that seemed to be reasonably entertaining. Much of the program took material straight from the film, but it chopped out a lot of bits along the way; it very much fits the “Reader’s Digest” mold. I don’t know how interesting it would be for someone who hasn’t already seen the movie, but I thought the radio piece was fairly enjoyable. The Archival Newsreel Footage includes two brief snippets that contrast the different social strata seen in Godfrey. The first - and longer - part of this four-minute, 25-second program dealt with the “forgotten men”, while the second showed us the rich folks. Additional material would have been better, since these snippets were pretty short, but they were still interesting features of the era. There’s virtually no difference between this disc’s Outtakes and those found with more recent films. During the 60 seconds of material, we see the actors - primarily Lombard and Powell - flub their lines and curse. Although this is exactly the sort of stuff that pads many other DVDs, I must admit the novelty made the snippets appealing. It’s so odd to see Thirties performers behave in a natural manner that I really enjoyed this brief piece. 33 photos appear in the Stills Archive. This area mixes production photos with publicity shots and offered nothing particularly exciting. There’s also the film’s Theatrical Trailer, but it’s not the original, despite what the case says; this one clearly states that it’s from a “re-presentation” of the movie. Lastly, the DVD’s booklet includes a short but decent essay from film historian Diane Jacobs. 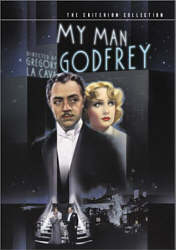 My Man Godfrey functions as a representation of its era, but don’t let that keep you from watching it. Despite clear roots in the Depression, it provides a witty and entertaining experience that transcends the years. The DVD provides moderately flawed picture and audio, but the movie both looks and sounds quite good for its age, and the package also contributes some very solid extras. Fans of the film should be exceedingly pleased with this DVD, and those new to the film will likely enjoy it as well.